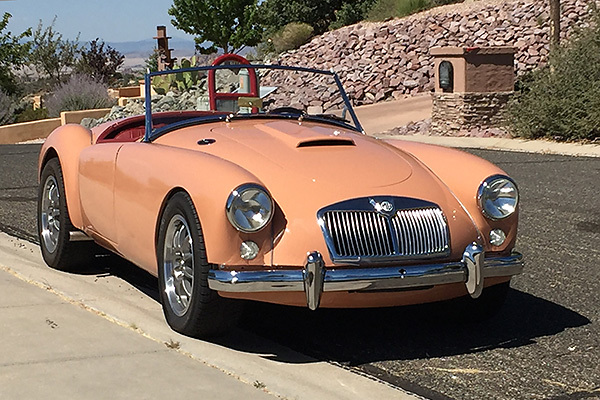 Please join me in congratulating Dan Beck on completing his awesome MGA V8! Gosh, a few hours in that. Classic look, clean engine bay, purposeful stance with a nice wheelarch gap, vintage interior. Alamo Beige paint (an MG factory color from 1959-1962). Beautiful auto and excellent choice of power plant. Kinda partial to the 5.0L Ford engines:-) The TKO should take any abuse that the owner will throw at it. The paint choice and enhancements are very tasteful. Great Job! Maybe a trip back east to one of our V8 Meetings? That is awesome!! Very well done. WOW, one crafty feller you are. The color choice is very cool. What a great car, I've come back to look at it a few times already. Nice choice of color, too.